London was at the fore-front of the industrial revolution. By the late 19th century, the city had grown tremendously as people moved from the country-side and agriculture to the city and the factories. The city was bursting at the seams, and thus a lot of money and energy was poured into building the infrastructure of London, much of it still in use today. Of course, 100 year old and older infrastructure does mean that there is a lot of maintenance that needs to occur. I wander around the city, I often see streets closed to traffic, with signs indicating work with the quaint name of “Replacing London’s Victorian Water Mains.” Despite the rather prosaic sounding name, it is a multi-million pound undertaking to update the infrastructure of London’s water system into this century. I am reminded of this infrastructure work further today as I try and reach my destination. For anyone who rides the London train and underground system, weekend closures is probably something of a swear word, an indication that travel will be a pain. 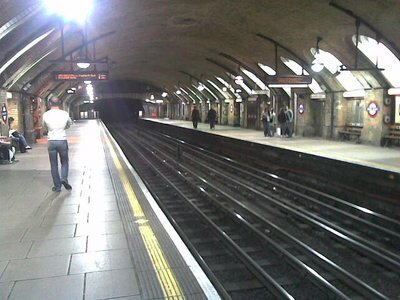 Much of the underground and rail network dates back a to late 1800s and early 1900s, including this platform at Baker Street, part of the world’s first underground train line dating back to 1863. Of course, not all the work is due to being really old, as this weekend includes closures on the Jubilee line from Green Park to Stratford (opened in 1999) and the Docklands Light Rail (opened in 1987). Also closed this weekend, though, was the Victoria line, dating back to 1968. Unfortunately, it was to a station on the Victoria line that I wanted to go. Instead, I needed to transfer at Baker Street to the circle line, riding it around to Victoria station, where I transferred to a Southern Line train service to Battersea Park Station. If there is one thing you learn quickly here in London, it’s to use all forms of transport available - Underground, Overground, Buses, Riverboat, and National Rail - anything that’ll take your Oyster Card. 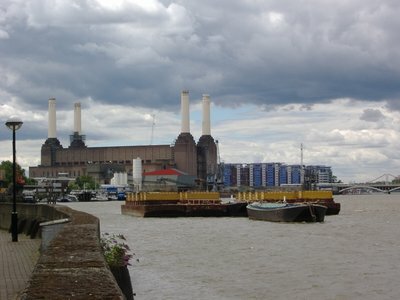 From Battersea Park Station, it was just a quick walk to my final destination, Battersea Power Station. Opened in 1939 by the London Power Company, the station was designed by Sir Giles Gilbert Scott, an industrial designer who was also responsible for the red telephone box so associated with London. 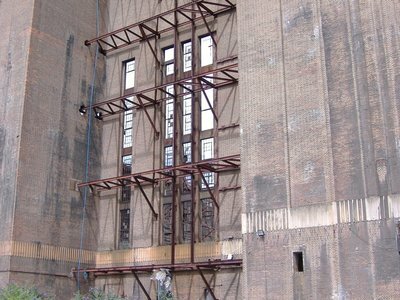 The plant, a coal fired plant that provided electricity to London, was expanded in 1955 to it’s present form with four stacks in an imposing red brick building. By 1983 both of the two generators were shut down, and the station fell into disrepair. 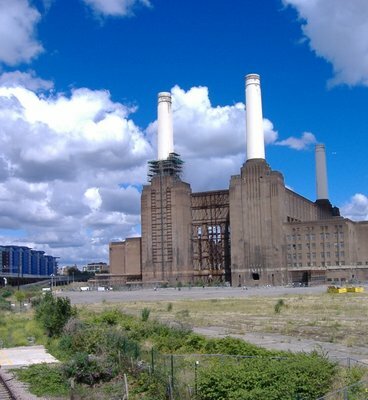 For those outside London, the station will probably best be known for appearing on the cover of Pink Floyd’s 1977 album Animals, with a large pink pig floating above it. Though tethered to the station, the large floating pig broke loose and rose up into the sky. Unfortunately for travellers into London that day, Battersea is below the flight path into Heathrow Airport, and so a large number of flights were delayed and cancelled while the pig floated above London, finally landing somewhere in Kent. 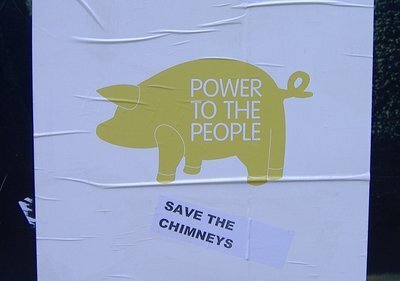 The pig has become something of a symbol for the power plant itself, and had been used in the campaign to notify the public of the free tours and consultations for future development going on this month. 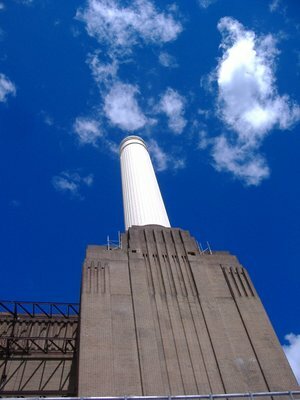 The power plant is quite imposing, a tall, thick red-brick structure with it’s massive stacks. 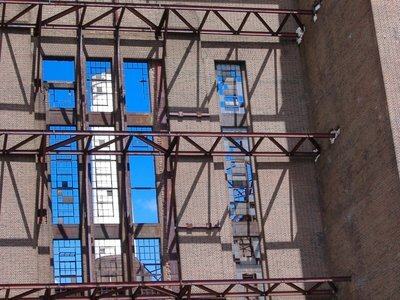 It has, however, been unused for a quarter of a century, so it has fallen into disrepair, the site covered with fallen brick and rusting metal. Currently, development plans have been drawn up to reclaim the site and turn it into a residential, shopping and business area. The plans are quite elaborate and grand, including a massive clear chimney that will vent hot air and bring in cool air into the “ecodome,” as a heating and cool measure. 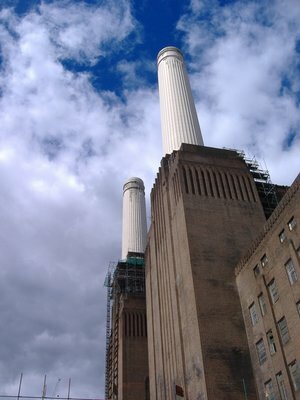 The glass chimney will tower above the four white stacks of the old Battersea Power Station. The plans are not without their critics, though, and they aren’t the first plans to redevelop the site. The next two years will be taken up with approvals. Beyond that, plans to extend the Northern tube line to the site to be completed by 2015, and the rest of the buildings on the site completed in a phased development after that. Still many years before the white stacks with be dwarfed by the glass eco-tower. Lots of time for them to tower over the south Thames.